According to the results of a reputable international survey Chambers Europe 2015, Ilyashev & Partners is recognized as a leading law firm in dispute resolution (litigation: Ukraine). The firm came third in the practices: dispute resolution (arbitration), labor law, energy and natural resources, intellectual property, tax. In addition, this year the expertise of Ilyashev & Partners Law Firm was marked in restructuring and bankruptcies. What the team is known for Exceptional team known for its activity on high-value litigation, and its expertise in cross-border disputes. Diverse expertise covers tax, insolvency, insurance and investment cases. What’s new? Opened a new office in Dnipropetrovsk, in eastern Ukraine. Work highlights Acted for BTA Bank on the enforcement of an English High Court order for the recovery of USD451 million. Represented A1 Investment Company in a USD50 million dispute over a Ukraine shopping centre. Managing partner Mikhail Ilyashev takes an active role in litigation cases and is appreciated for his “strong understanding of clients’ needs and ability as a great strategic thinker.” He represented Nadra Bank in a debt collection case against Freedom Pharm. Significant clients Antonov, Kyivstar, METRO Cash & Carry, Eli Lilly, Naftogas. What the team is known for Maintains a strong reputation for litigious employment cases. Acts for clients on labour contracts, employee benefits, work permits and lay-offs. A popular choice as local counsel for several international law firms. Work highlights Advising METRO Cash & Carry on trade union issues, including disputes over dismissed employees. Notable practitioners Mikhail Ilyashev heads the department and is the key point of contact for clients. Significant clients METRO Cash & Carry, Nadra Bank, National Credit Bank, ProCredit Bank, The World Bank. What the team is known for Represents oil and gas, mining and renewables clients in diverse matters, ranging from competition clearance to extraction projects. Expertise covers investment activities, licences and permitting and construction projects. Recommended for energy litigation due to its well-known strength in dispute resolution. Work highlights Represented Black Iron in disputes against the State Ecological Inspection, regarding its activities in Ukraine. Notable practitioners Managing partner and head of department Mikhail Ilyashev is the key point of contact for clients. Significant clients Naftogaz, Ecom Tech, Gaztek, Biogazenergo, Ukrgaz. What the team is known for Well-known practice handling IP disputes and M&A-related mandates. Involved in a number of high-profile pharmaceutical transactions as well as being active in licensing, IP audits, and patent and trade mark filings. Work highlights Representing Megainpharm in proceedings concerning the refusal of a trade mark registration. Represented Nycomed in litigation regarding the protection of a trade mark. Notable practitioners Irina Kirichenko is an experienced litigator who is most active in the pharmaceutical industry. She is a registered patent attorney, and recently represented Antonov in connection with the protection of several trade marks. Significant clients Mitek, Eli Lilly, Lundbeck, Morion, Woerwag Pharma. What the team is known for Sizeable team providing tax counsel on structuring and transactional matters. Assists with contentious cases against the tax authorities, and has additional experience in VAT and customs. Work highlights Advising BTA Bank (Kazakhstan) on tax issues related to several transactions. Assisted Vitmark-Ukraine with a dispute with the tax authorities concerning profit tax. Notable practitioners Department head Maksym Kopeychykov is praised for being “very efficient, helpful and able to grasp complex deals.” He advises on contentious and non-contentious tax mandates, and recently acted for FSC More on a dispute with the tax authorities. Representated Vitmark-Ukraine during hearing on illegal decrease of negative profit tax by the tax authorities. 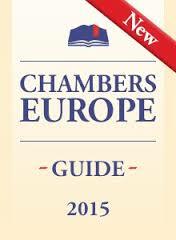 Chambers Europe is a special legal guide that has been published by Chambers & Partners since 1999. The directory researches the legal profession, identifying the leading lawyers and law firms through interviews with thousands of lawyers and their clients. The directory has got a good reputation based on the independence and objectivity research. Chambers Europe provides in-depth analysis of the legal markets in 52 jurisdictions.